M and C’s relationship is more than just Sun sign compatibility of Pisces and Capricorn. No individual is a pure Pisces or Capricorn but instead is a unique combination of signs and planets. The following interpretation defines the synastry or interplanetary aspects between the planets in C’s birth chart and the planets in M’s birth chart. There is no evil planet in the combinations. No single combination can make or break the relationship. The list goes from the most harmonious (positive) to the most discordant (negative). C’s Jupiter Trines M’s Jupiter (+11.30 harmony) – The individual sense of growth, expansion, or generosity combines very comfortably with the couple. C and M’s point of view about philosophy, ethics, or religion are in harmony. Both support each other to expand their horizons. The relationship encourages optimism, self-confidence, and humor. Usually, the older person will guide the younger. C’s Venus Conjuncts M’s Venus (+7.60 harmony) – The individual sense of sexuality, attraction, or intimacy combines with ease within the couple. There is harmony in the way each other expresses affection. Social, cultural, and financial values are the same. Both enjoy the same pleasures in life. C and M have the desire to help and encourage each other. The relationship can lead to a long-term partnership. C’s Sun Sextiles M’s Moon (+6.90 harmony) – C’s sense of identity, ego, will, and character combine pleasantly with M’s emotional needs. There is a natural stimulation and flowing compatibility between C and M. Reconciliation after a disagreement is ordinary. This is an ideal aspect to have in a romantic relationship. C’s Sun Sextiles M’s Sun (+5.72 harmony) – The individual sense of identity, ego, will, and character combine pleasantly with the couple. The similar temperaments of C and M can stimulate each other to achieve their goals in life. There is a strong sense of compatibility between M and C. Both are supportive of each other’s basic needs. This aspect is mutually beneficial for marriage. C’s Sun Trines M’s Saturn (+3.19 harmony) – C’s sense of identity, ego, will, and character combine very effortlessly with M’s sense of commitment, necessity, or duty. There is harmony and natural respect for each other. C and M are both willing to work out difficulties in their relationship. There is a mutual appreciation of responsibility and heartfelt commitment to one another. This aspect aids endurance in marriage. C’s Venus Conjuncts M’s Uranus (+2.70 harmony) – C’s sense of sexuality, attraction, or intimacy combines with M’s sense of independence, freedom, and originality. There is natural stimulation of each other’s creativity in music or art. Both contribute to each other’s goals, ambitions, and dreams. M is tolerant and encouraging toward C. C can be more creative than M. There is a feeling of instant attraction that may become a long-term relationship. M’s Neptune Sextiles C’s Pluto (+2.68 harmony) – M’s mystical or spiritual inclination combines pleasantly with C’s sense of transformation, change, or power and destiny. The spiritual urge of M stimulates the reforming urge of C. Both will support and encourage each other’s spiritual enlightenment. The relationship inspires each other to meet the world with compassion and grace. M’s Moon Sextiles C’s Neptune (+2.60 harmony) – M’s emotional needs combine pleasantly with C’s sense of spirituality, imagination, or mystical inclination. The relationship stimulates mutual inspiration and devotion to each other. Telepathic communication with each other is possible. Both M and C have an affinity in mystical, esoteric, or even occult studies. There is a minor irritation when both seem distant or aloof to the other. C’s Venus Sextiles M’s Mars (+1.67 harmony) – C’s sense of sexuality, attraction, or intimacy combines pleasantly with M’s sexual drive, temper, and powers of self-assertion. M’s desire stimulates C’s loving nature. Both are strongly attracted to each other. This aspect is favorable in marriage and offers a sexually satisfying relationship. C’s Uranus Conjuncts M’s Neptune (neutral) – C’s respect for expression of individuality combines with M’s mystical, spiritual inclinations. There may be a similarity of social or political views between C and M. Each partner will share radical new ideas. The relationship gives a feeling that anything is possible when both are together. There is a creative union of rebellion and idealism. This can sometimes encourage M or C to evade responsibility. M’s Moon Squares C’s Jupiter (-0.10 discord) – M’s emotional needs interact stressfully with C’s sense of growth, expansion, or generosity. It’s common to have disagreements about religion, finances, and family matters. The friction between M and C is not enough to create serious difficulty in the relationship. M may feel uncomfortable when C misunderstands a passing mood. C may make extravagant pledges making M to expect too much and be disappointed when the promises are broken. M’s Jupiter Squares C’s Neptune (-0.63 discord) – M’s sense of growth, expansion, or generosity interacts stressfully with C’s sense of spirituality, imagination, or mystical inclination. There is a tendency to encourage bad habits of extravagance, gambling, or laziness. M might unintentionally hurt C’s sensitive feelings. C may appear elusive to M. There is friction in spiritual or philosophical beliefs. C’s Mars Conjuncts M’s Neptune (-1.82 discord) – C’s sexual drive, temper, and powers of self-assertion may combine with M’s sense of spirituality, imagination, or mystical inclination. C excites M’s emotions. M encourages C to have bigger goals. C can overstimulate the imagination of M. M can have a dissolving effect on the energies of C. The relationship can be confusing for both C and M. There is a strong possibility of self-indulgence in one or both. M’s Jupiter Squares C’s Uranus (-3.05 discord) – M’s sense of growth, expansion, or generosity interacts stressfully with C’s sense of independence, freedom, and originality. There is friction in M’s aspirations and C’s individualistic ideas. C will seem rebellious or unstable to M. One or both will show extravagance and resistance to responsibility. M’s Mars Squares C’s Neptune (-3.41 discord) – M’s sexual drive, temper, and powers of self-assertion interact stressfully with C’s sense of spirituality, imagination, or mystical inclination. There is friction in C’s elusive reaction to M’s unexpected behavior. The relationship can cause emotional disturbance and extravagance in one or both. M’s Mercury Squares C’s Pluto (-3.72 discord) – M’s mentality and powers of perception interact stressfully with C’s sense of transformation, change, or power and destiny. Both M and C have a robust mental effect on each other. There is friction in the difference of opinion and method of dealing with a problem. Frequent battles of the mind are expected in the relationship. Expressing one’s vulnerability is a hard thing to do for both C and M.
C’s Mercury Squares M’s Jupiter (-5.29 discord) – C’s mentality and powers of perception interact stressfully with M’s sense of growth, expansion, or generosity. There is friction in the exchange of ideas in the relationship. C will seem petty to M. M might promise more than can be delivered. This is not a serious conflict if there are many harmonious aspects to the relationship. C’s Mars Squares M’s Jupiter (-5.31 discord) – C’s sexual drive, temper, and powers of self-assertion interact stressfully with M’s sense of growth, expansion, or generosity. There is friction in C’s instincts and M’s ethical point of view. There is a natural tendency to be extravagant in one or both individual. C’s Mercury Squares M’s Saturn (-6.41 discord) – C’s mentality and powers of perception interact stressfully with M’s sense of commitment, necessity, or duty. There is friction in M’s criticism and disapproval of C’s achievements. C may seem careless and annoying to M. M may appear cold and bossy to C. The friction in the relationship can be a challenge to help each other grow in wisdom. M’s Moon Conjuncts C’s Saturn (-7.29 discord) – M’s emotional needs combine with C’s sense of commitment, necessity, or duty. Whether the fusion will work for good or ill will depend on other aspects. C tends to discipline that can adversely affect the feelings of M. M may feel restricted and resentful of the limitations that C imposes in the relationship. This aspect usually forms when there is a wide age gap between M and C.
M’s Sun Conjuncts C’s Saturn (-9.79 discord) – M’s sense of identity, ego, will, and character combine with C’s sense of commitment, necessity, or duty. A sense of duty and responsibility weigh heavily in the relationship. C has the tendency to criticize and judge M’s actions. C sometimes blames M when something goes wrong. 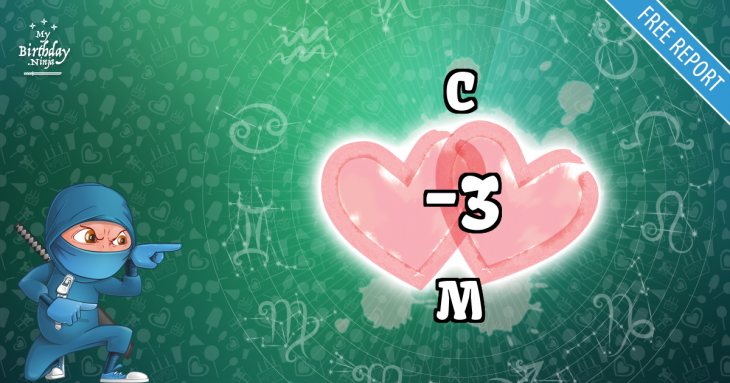 M is more tolerant and forgiving towards C. M can learn needed lessons of discipline and patience from C.
C’s Sun Squares M’s Mars (-14.02 discord) – C’s sense of identity, ego, will, and character interact stressfully with M’s sexual drive, temper, and powers of self-assertion. There is friction in the individual ambitions of C and M. Hostility and aggression are easily aroused in the relationship. A compromise between M and C is necessary for the union to work. M will have to work on patience while C will have to work on humility. There are 6 mutual receptions in C and M’s planet combinations. Planets in mutual reception enhance each other. This will add +60 harmony to the total score. The remaining -46.52 discord is due to some minor aspects or planets in parallel. Ssshhh! C, don’t let M know. You are most compatible with a person born on March 23, 1996. You have a whooping birthday love match score of +198 with that person. Check it out and imagine what it feels like to be with your soul mate.